12 to 13.99 Square Inch Custom Die Cut Magnets 20 Mil are unique promotional gifts that will afford you great exposure and popularity without overspending. These promotional magnets are unlike other cheaper promotional gifts that fade with time. 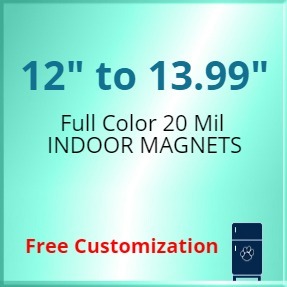 Made of 20 MIL stock material with strong magnet backing, these promotional die cut magnets will be appreciated over the refrigerator door, cabinet or any metallic surface where they are fixed. Our free full color printing will allow you to experiment with brilliant presentation styles. Order yours today! Request a quote to know what you may save on bulk orders of 12 to 13.99 Square Inch personalized Die Cut Magnets 20 Mil. Product Weight: 7 lbs per 250-approx.